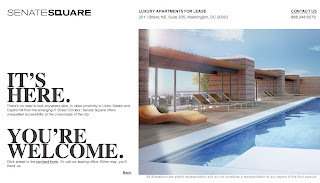 DC Home and Condo Prices: Senate Square: Contra-rondo? 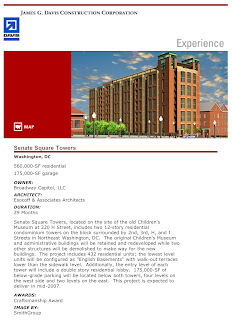 Near Union Station, this 480-unit development [actually 432], formerly named Senate Square Condos, will have two new 12-story buildings next to the Children's Museum which is being renovated into lofts by Abdo Development (Landmark Lofts at Senate Square). The buildings are called The Concord and The Lexington. Units will have hardwood floors, 9-foot ceilings, floor-to-ceiling windows, and upscale finishes including granite countertops and stainless steel appliances. The building will have a rooftop pool and fitness facility. Designed by Esocoff & Associates. Original prices are expected to range from the mid-$300's to over $900's for one and two-bedroom floor plans, many with a den. Sales have 'temporarily halted' - until Sept. 24, while - officially - they await new higher prices. Unofficially, stopping sales at this point means - they are keeping all options on the table? 432 new condos in two 12-story towers next to the old Children's Museum (now Landmark Lofts)... Prices reduced - studios from the high $200s, 1 BR's start at $334,000, 2-bed units start in the high $400k's - not bad deals, 145 units have sold, occupancy on West building now delayed until Nov. 2007... Development by Broadway of New York, one of their first DC projects (also building DuMont), sales by Mayhood, marketing by Shvo of NYC. Sales began in September of 2005. A view of the building's web site confirms its conversion to apartments. Back in the boom times, the word "rondo" was coined to describe apartments being converted to condos. Witness 555Mass and the Radius. So now what word should we use for condos that are converted to apartments? Conpartments? I live a couple of blocks away and I thought something was up with those condos. They've been taking their sweet time completing them. They look like really nice apartments. The problem is they are still in a fairly sketchy part of town. It's the wrong place to build luxury condos/apartments. That said, a new influx of apartments may help reduce rent in my area. Having more expensive condo's in your are will only raise your rent. I own a place that i rent out 4 blcoks from Senate Square. The rent I charge to my tenants looks small compared to Senate Square, so my tenants will be getting an increase not decrease. Sorry to rain on your parade. Luzury apartments or condos built in trnasitinal areas are alwyas good for the negiberhood, and sorry to say but will bring prices up for everyone.